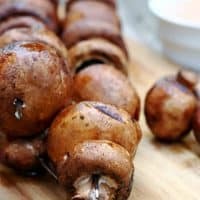 BALSAMIC GRILLED MUSHROOM KABOBS WITH SAVORY MAYO DIPPING SAUCE — Fresh mushrooms are marinated in balsamic vinaigrette, then skewered and grilled to perfection and served with a steak sauce infused mayonnaise for dipping. During the summer, we use our grill for just about everything, including fruits and vegetables. 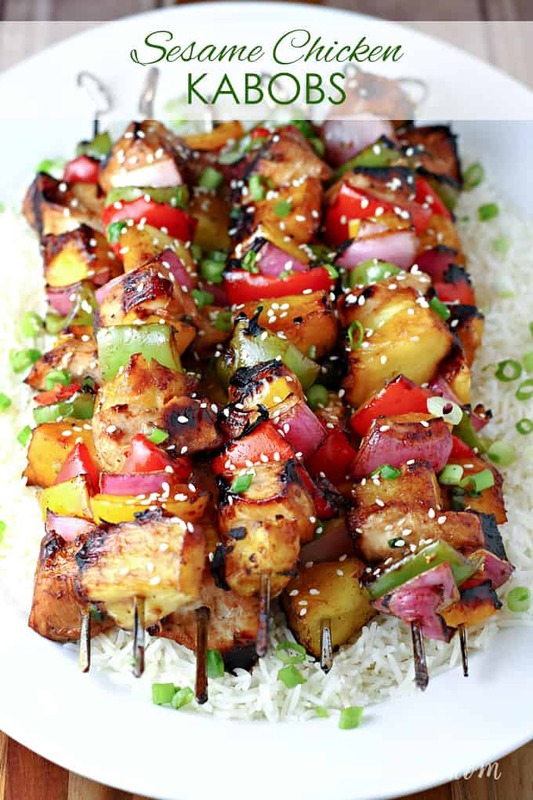 It’s so easy to add some seasoned, marinated veggies to the grill while your hot dogs and burgers are cooking and make a complete meal without ever turning on the oven. 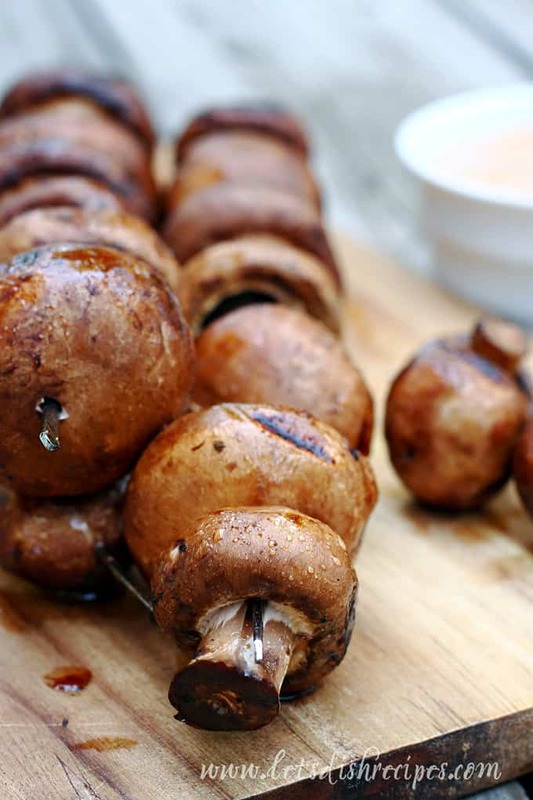 And these Balsamic Grilled Mushroom Kabobs are one of our all-time favorite grilled sides! Almost any kind of mushroom will work in this recipe. Baby Portobellos are my favorite, but really, these turn out delicious no matter what variety you use. Not to mention, these mushroom kabobs pair perfectly with almost any grilled meat, including burgers, steak and grilled chicken. All you have to do to prep is layer your mushrooms in a baking dish and cover them with some Kraft Balsamic Vinaigrette, then pop them in the refrigerator for a few hours to soak up all that delicious flavor. The great thing about mushrooms is that they’re like little sponges, so they really take on the flavors of your marinade. 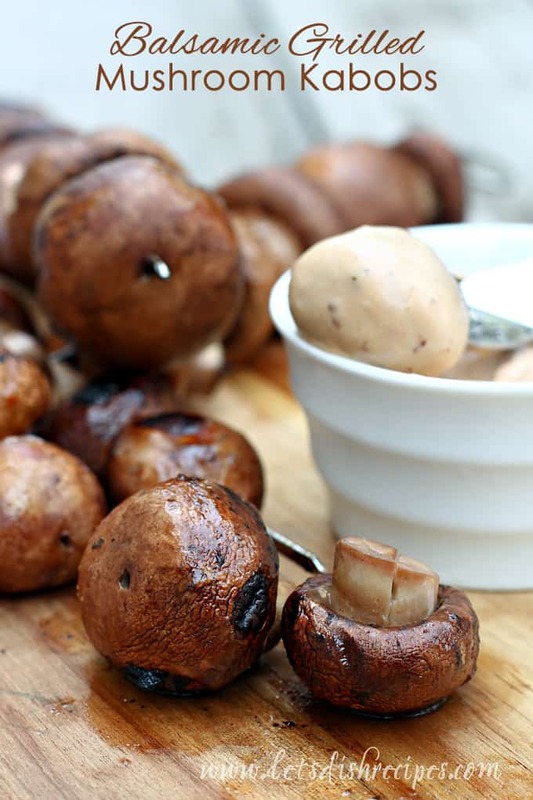 While you let your mushrooms marinade, whip up your dipping sauce. Just combine some Kraft Mayo and A1 Steak Sauce with a dash of pepper and you’re good to go. Honestly, the mushrooms are completely wonderful on their own, but I do love a good dipping sauce. And my kids will eat almost anything if I give them something to dip it in. Not to mention, the sauce is also great on grilled burgers, hot dogs, and steaks. I used Kraft Mayo with Olive Oil, but any variety works great in this recipe. When it’s time for dinner, just thread your mushrooms onto some skewers (be sure to soak wooden skewers first) and cook them over medium high heat for 8-10 minutes. Seriously, something so delicious should not be so easy! Be sure to save this Balsamic Grilled Mushroom Kabobs recipe to your favorite Pinterest board for later. 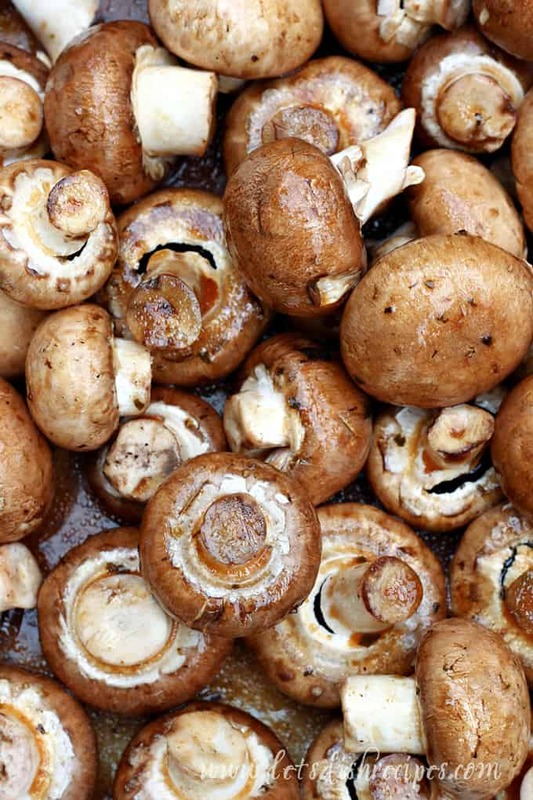 Place mushrooms in a shallow baking dish. 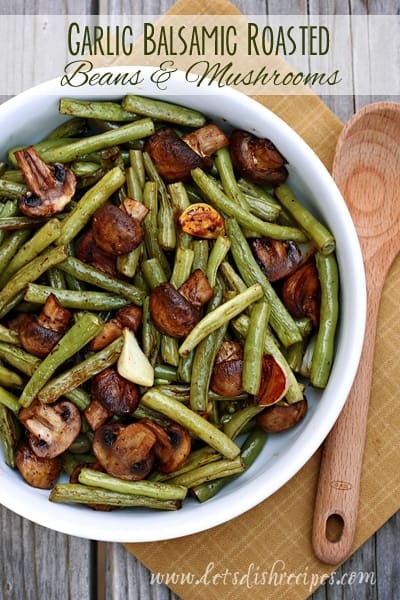 Pour balsamic vinaigrette over mushrooms and toss to coat. Cover and refrigerate for at least 2 hours. Meanwhile, prepare dipping sauce: in a small bowl stir together mayo, steak sauce and pepper. Cover and refrigerate until serving. Preheat grill for medium-high heat. Thread mushrooms onto skewers (be sure to soak wooden skewers for at least 30 minutes prior). 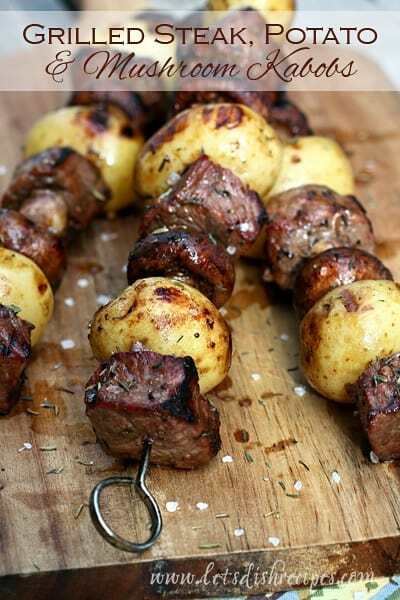 Place mushroom kabobs onto grill and cook for 8-10 minutes, turning half-way through cooking. Serve with dipping sauce. Total time does not include marinading mushrooms. We love mushrooms in our house. These look delicious! I’m especially loving that dipping sauce – YUM! The balsamic flavor didn’t really stand out. We love mushrooms so much that it didn’t matter. Especially with this dipping sauce.